Japan is starting to become divided. It is very clear that people are not sure what is going to happen. Lack of information and lack of communication between leadership and the public amidst the growing concern about the amount of radiation present in the affected areas around Fukushima has become a focal point for news and media. News stories accusing the government of cover ups and neglect on one side and conservative news defending the government position and accusing others of creating panic and rumor from misinformation on the other. Both seemingly are causing confusion about what can be done. The government recently decided to raise the safety standard of 1m Seivert/year for public facilities to 20m Sievert/year. This choice caused senior adviser Toshiso Kosako to promptly resign, who did so regrettably with tears. This scene stirred doubt in the heart of the public about public safety, especially regarding schools. Children and young adults are the most susceptible to radiation. The current levels of radiation present may remain so for generations ultimately cutting thousands, maybe millions of lives short. 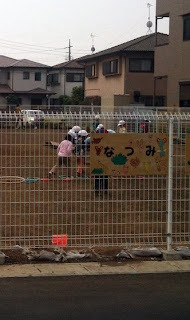 A nursery with children from 1year of age to 5 years of age play oblivious in a yard with radioactive soil in Chiba, which has hot spots of radiation as high as Fukushima fallout. School grounds are mostly dirt and this dirt is absorbing large doses of radiation around the clock. Children from infancy all the way to high school daily spend time on these grounds playing, training, and holding events year round. Parents in Fukushima, in particular, are beginning to become fed up with the government`s inability to answer the real concerns over why the standard was raised and what evidence was used to support the decision. They show their frustration by eventually saying to officials in an official statement, "If the government won't remove the radioactive dirt then we'll do it ourselves and dump it outside the headquarters of Tokyo Electric." Middle schools and High schools use school grounds for practice and events. These students are gathering on radioactive ground in Matsudo, Chiba. The city with highest level of radiation in the Chiba prefecture. So the lingering question remains...Who do you trust? Has Japan`s government passed a death sentence on its future generations? Or is it simply trying to keep the situation under control by re-ammending its overly cautious safety standards? Or is the truth somewhere in between? I wish I could say I know what is going on, but I am still thinking through it all. I`m still trying to recover from my surgery and everything that has happened in the last two months. But "risk" is certainly for real in this scenario and that is something that keeps many people like myself up at night checking facts, figures and radiation readings and so on...only 4 hours sleep a night might get to me before the radiation does! 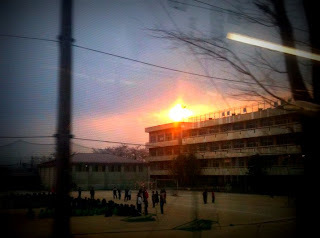 Article link below gives you a good idea of the situation in Fukushima, but in Chiba and the Kanto region people are far less aggressive and confrontational about the situation, probably to their detriment. I pray that all are safe and assured safety with clear evidence soon...God bless you and your family too..
Goodness gracious =( Expect my prayers!